l to r. Lucianne McEvoy, Darragh Kelly, Brian Gleeson, Frank McCuster, Gary Lydon. For an Irish play set in an out of the way bar, The Weir is pretty sobering. That it is also witty, articulate, and beset by place, loss and sprites is less of a surprise. Writer Conor McPherson has serious form by now when it comes to the dregs of self at the bottom of a glass, or more cheerfully, to the poetry in the head of a creamy pint of Guinness. Except that the Guinness in Brendan’s bar is ‘off’ because the fecking tap is broken. Jack has to help himself to a bottle (it’s that kind of village pub); Finbar’s ok because he’s become a tad more sophisticated and drinks Harp Lager; Jim, gentle soul, is happy with small chasers; Brendan is pleased to keep them company; and Valerie, well, she’s down from Dublin and might stay a while. She has a white wine – awkward – poured in a straight glass. There is no smoking ban yet and Designer Francis O’Connor has the craic curling across a wide, low beamed, space with the telegraph poles leaning drunkenly outside. There is a television above the bar but it’s a careful, appealing touch when Jack reaches up to switch off the rugby – it might have been gaelic football. The reception was bad anyway. Nothing interferes with the story telling and there is no interval. First, Jack with his faerie road and spooky knocks at the door; then Finbar, with a terrifying old woman on the stairs; then Jim’s unwitting shocker in the graveyard that summons Valerie’s nightmare; and finally, cleverly, at the fireside, it’s back to Jack as he mournfully recalls his lost chance at love and marriage. Each tale is far too enthralling, too involving and heartfelt, to be contained as a monologue. The silence after Valerie’s story is literally stunning. 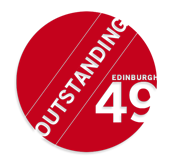 Director Amanda Gaughan lets it down evocatively, rendering the men helpless in their sympathy. McPherson’s achievement is to write bar stool conversation that is as moreish as good peanuts, wholesome against the odds. And the Irish cast are very, very good at helping themselves: Gary Lydon as Jack, sturdy, crumpled; Darragh Kelly as Jim, fond, credulous; Brian Gleeson (yes, son of ….) as Brendan, open, obliging; Lucianne McEvoy as Valerie, injured, self-possessed. And Frank McCusker as Finbar, whose equable, decent, tones stay short of the self-satisfied. 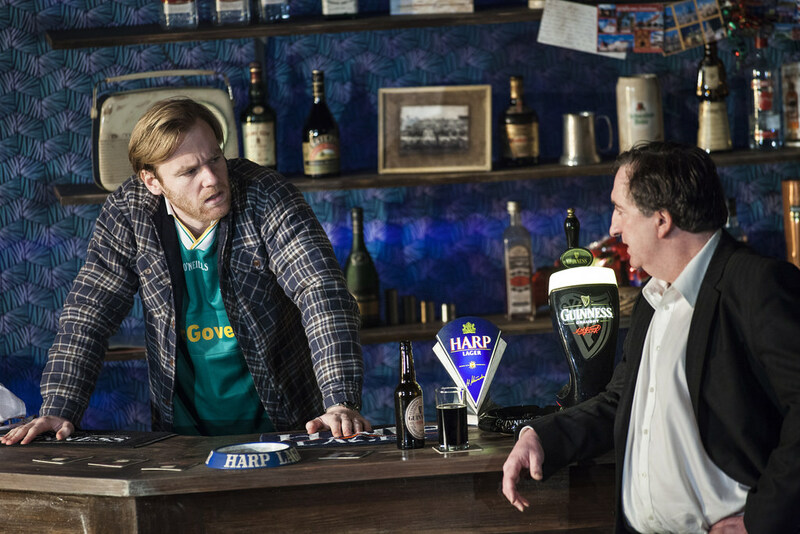 Brian Gleeson, Brendan, and Gary Lydon as Jack. Harp Lager and Draught Guinness as themselves. 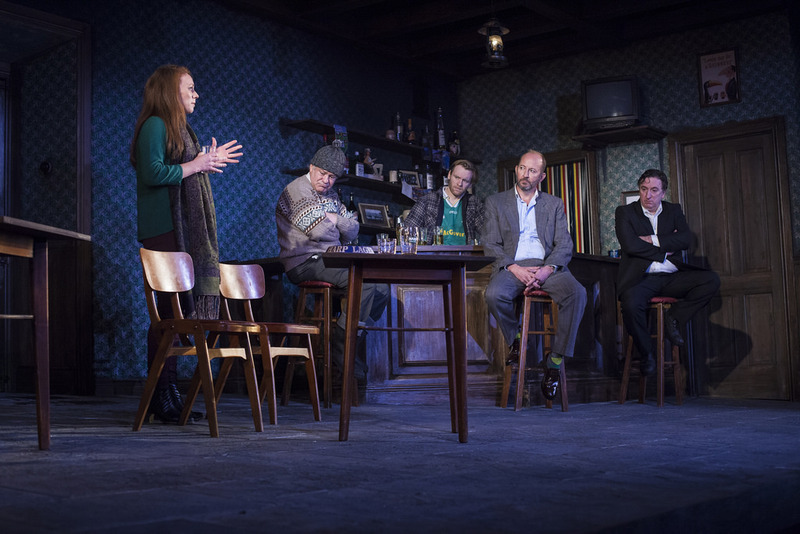 ‘The Weir’ was written in 1997, enjoyed immediate success and has attracted lyrical approval thereafter. Personally, I’ll play safe and just recognise how companionable a piece it is. You will not want to let these characters go home in the rain*. Single men, who know each other well, have gathered hospitably, stood each other a drink (or two), and have talked idly. However, there is the one woman amongst them and it’s Valerie who’s channeling the hard stuff.